Learn how to integrate Chime with the Microsoft Bot Framework. To learn more about how to integrate with 3rd party tools such as Microsoft Dynamics, ServiceNow, Salesforce, visit the Virtual Agent Integration page. Goal: Our goal is to have a bot that initiates a chat (and not just waits to respond) when a user connects and asks them if they would like to chat with Sales or Support, which represents two different Chime queues. We want to show a button to the user so that all they have to do is simply click which button they want and then have the bot open a link to the corresponding Chime queue. The Bot Framework has documentation for developing bots in both C# and Node.js, but we will be focusing on C# in this example. Follow Microsoft's documentation above to build and deploy a simple echo bot. We'll modify this out-of-the-box bot next. OK...now that you have a simple echo bot up and running. Let's make our simple code changes. The following will demonstrate how to create an Adaptive Card and add two OpenUrlActions that correspond to our Sales and Support queues. Note: Many bot framework tutorials will focus on altering the code to that handles the bot's response to an incoming message. You will see this in the code when checking to see if the activity type is an ActivityTypes.Message. But recall our goal is to have the bot initiate the chat itself and not wait for the user to say something first so we need to change the code when the activity is a ConversationUpdate update instead. This occurs when users the conversation state changes, and one of these includes when a member joins the conversation. 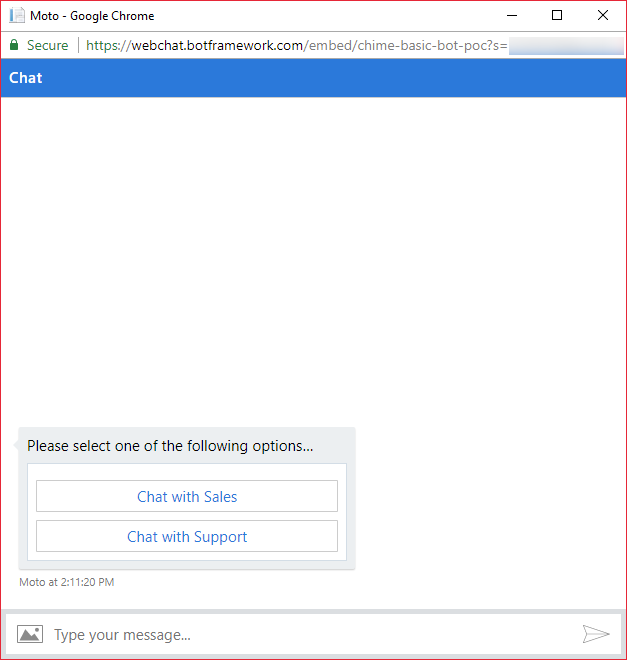 Title = "Chat with Sales"
Title = "Chat with Support"
In this example, we'll help you get started building a custom web client using the Direct Line API. To speed things up a bit, we've built a simple and lightweight Angular + Bootstrap 4 seed project designed to get you up and running. You can get to it at this GitHub page https://github.com/mhthompson86/angular-directline-webchat . Before anything will work, you must configure the project to use your bot's Direct Line secret key. To do this, copy the secret from your bot's Direct Line channel on the Azure portal and paste it into the directLineSecret.json file that can be located in angular-directline-webchat/src/app/directLineSecret.json. To make it easier for you, we created a settings.ts file that will contain some information that will get used in various places in the code. Just swap out the values for the ones you want. The settings.ts file can be located in angular-directline-webchat/src/app/settings.ts. If you are able to connect, then you are all set and you can start customizing the project however you see fit!